According to the Met Office coastal parts of the Canaries can expect some of the bad weather that has battered other parts of Spain this week. As the tail end of the ferocious storm that has already caused millions of euros damage to seafronts in the Basque Country and Cantabria moves away from the mainland, forecasters predict it could affect the coasts of almost all the Canary Islands, except El Hierro. 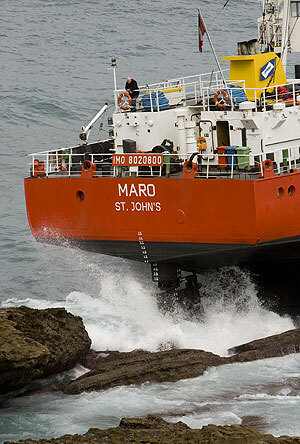 The merchant ship ‘Maro’ with 54 tons of fuel on board has been lying aground off the coast of Guipúzcoa, Northern Spain since last Thursday night. The Coastguard originally planned to start the operation to transfer the fuel on Sunday, but were forced to postpone the attempt due to the bad weather. Also reported was a car which was lifted off the ground by a giant wave and tossed through the plate-glass front of a hotel restaurant. The regional government is urging people in the Canaries to take extra caution when near the seafront and in exposed places.